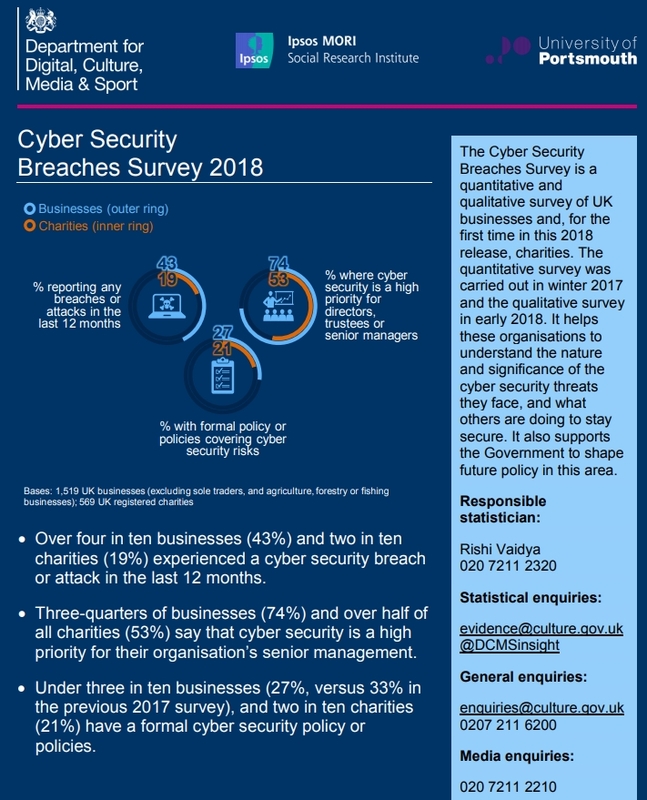 Specifically, the last bullet point is shocking: the survey found that less than a third of UK organizations have "a formal cyber security policy or policies". That seems very strange given the preceding two bullet points, firstly that more than a third have suffered "a cyber security breach or attack in the last 12 months" (so they can hardly deny that the risk is genuiine), and secondly a majority claim that "cyber security is a high priority for their organisation's senior management" (and yet they don't even bother setting policies??). Even without those preceding bullets, the third one seems very strange - so strange in fact that I'm left wondering if maybe there was a mistake in the survey report (e.g. a data, analytical or printing error), or in the associated questions (e.g. the questions may have been badly phrased) or in my understanding of the finding as presented. In my limited first-hand experience with rather less than ~2,000 UK organizations, most have information security-related policies in place today ... but perhaps that's exactly the point: they may have 'infosec policies' but not 'cybersec policies' as such. Were the survey questions in this area worded too explicitly or interpreted too precisely? Was 'cyber security' even defined for respondents, or 'policy' for that matter? Or is it that, being an infosec professional, I'm more likely to interact with organizations that have a clue about infosec, hence my sample is biased? Thankfully, a little digging led me to the excellent technical annex with very useful details about the sampling and survey methods. Aside from some doubt about the way different sizes of organizations were sampled, the approach looks good to me, writing as a former research scientist, latterly an infosec pro - neither a statistician nor surveyor by profession. "Cyber security includes any processes, practices or technologies that organisations have in place to secure their networks, computers, programs or the data they hold from damage, attack or unauthorised access." Nice! That's one of the most lucid definitions I've seen, worthy of inclusion in the NoticeBored glossary. It is only concerned with "damage, attack or unauthorised access" to "networks, computers, programs or the data they hold" rather than information risk and security as a whole, but still it is quite wide in scope. It is not just about hacks via the Internet by outsiders, one of several narrow interpretations in circulation. Nor is it purely about technical or technological security controls. "Breach" was not defined though. Several survey questions used the phrase "breach or attack", implying that a breach is not an attack, so what is it? Your guess is as good as mine, or the interviewers' and the interviewees'! Overall, the survey was well designed, competently conducted by trustworthy organizations, and hence the results are sound. Shocking, but sound. I surmise that my shock relates to a mistake on my part. 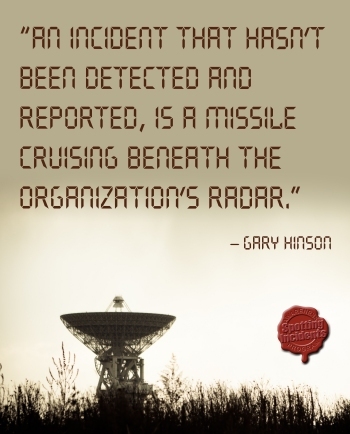 I assumed that most organizations had policies in this area. As to why roughly two thirds of them don't, one can only guess since the survey didn't explore that aspect, at least not directly. Given my patent lack of expertise in this area, I won't even hazard a guess. Maybe you are willing to give it a go? Blog comments are open. Feedback is always welcome.